Dr. Boccard has been working in the field of keyboard injury prevention for more than six years with some of today's leading methods and approaches such as the Lister-Sink method, the Taubman approach, Alan Fraser’s approach to technique and Effortless Playing with Nancy Reese. 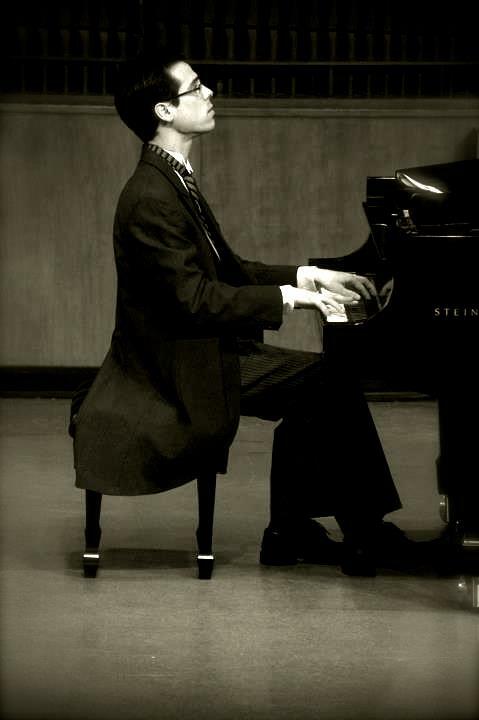 Dr. Boccard's extensive knowledge can provide injured pianists or simply pianists who experience limitations in their playing a unique solution. Dr. Boccard has been working in the field of keyboard injury prevention for more than ten years with some of today's leading methods and approaches such as the Lister-Sink method, the Taubman approach, Alan Fraser’s approach to technique and Effortless Playing with Nancy Reese. Dr. Boccard's interest for holistic methods has also brought him to work intensively with Alexander technique teachers and Feldenkreis® practitioners. He also uses the Tomatis® Method and Forbrain® to help pianists and musicians improve their listening, musicality and fine motor coordination as well as INLP techniques to help boost concentration, memorization and confidence. Dr. Boccard is constantly seeking new neuro-pedagogical methods to helps his students improve their musicality, technique, well-being and overall musical experience. Dr. Boccard's extensive knowledge can provide injured pianists or simply pianists who experience limitations in their playing a unique solution. Retraining usually requires an extensive period of time as it takes time and patience to relearn new healthy habits at the keyboard. The Dorothy Taubman Approach is based on a series of different motions and skills that are gradually integrated into a facile, healthy and expressive technique. This approach has been used to help injured musicians for several decades with great success. Dr. Boccard is a regular attendee of the Golandsky Summer Symposium in Princeton (NJ) and has worked actively with John Bloomfield, Robert Durso and Edna Golandsky. Dr. Boccard is currently training with Beth Grace in Kansas City. The Barbara Lister-Sink Method treats with the mechanisms of both the piano and the human body through a systematic approach - from the simplest coordination of the most fundamental levels of sound production, to the most complex kinetic patterns. It is strongly using the principle aspects of the Alexander Technique on muscular and mental release. Dr. Boccard worked for many years with Dr. Lister-Sink and her revolutionary method. He also completed a Keyboard Injury Certificate with Dr. Lister-Sink In Winston-Salem, North Carolina. Alan Fraser's approach connects the Feldenkrais Method and piano technique to reeducate injured pianists by becoming aware of their neuro-motor ability and skeletal structure. Fraser's background in Feldenkrais plays a large part in the unique view he brings to piano technique; Dr. Boccard attended several of Fraser's summer symposiums and is very familiar with this keyboard approach. Effortless Playing by Nancy Reese is a unique technical approach going against most current common pianistic ideas. Some of them are: to overcome gravity, suspension is the key, not relaxation.The use of the body is primordial as the arms are suspended by the torso. Dr. Boccard has worked several times with Nancy Reese over the last few years.